As Homer is the “end of the road”, the only way we can go is back the way we came. At least until we get to Wasilla. 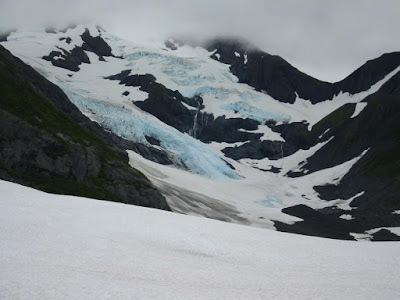 We bypassed Seward and went back to the Forest Service Campground near Portage Glacier called Williwaw. When we were there last month it rained non-stop for all three days. 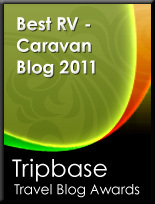 (Our July 30th blog entry about Williwaw Campground ) As we said then even though it rained all three days “This is the MOST SPECTALUAR setting for a campsite since we have been on the road.” This visit we did have some rain every day, we also had partly sunny days as well. Right next to Williwaw campground is a salmon viewing area. 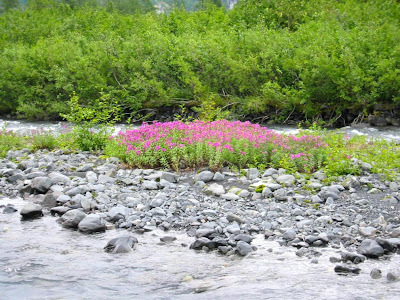 This is an area where salmon come to breed and die. When we were here in July we didn’t see any salmon at all. 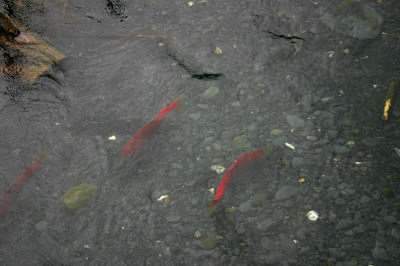 This time the river is full of Coho or Silver Salmon. Most are still alive but all will have spawned and died over the next few weeks. One piece of unfinished business from our last visit was a hike to Byron Glacier. Like Exit Glacier near Seward this is an easily accessible glacier. 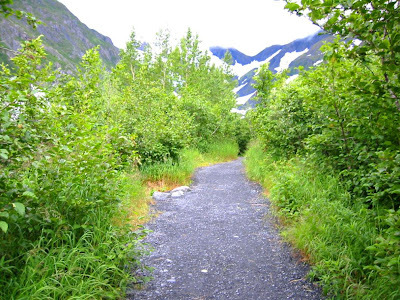 The trail is less than a mile over mostly flat terrain. One thing I found very odd about the trail is: this is bear country and they have sign at the beginning of the trail warning about bears in the area. In bear country they always tell you to “be very careful around willows as they are food source for bears”, “make noise so that you don’t surprise a bear” and “keep on the lookout for bears near the trail”. So the Forest Service has built this mile long trail that is completely lined with willows and alders, so dense that you can’t see more than two feet off the trail. Right next to the trail flows a stream that is so loud you can’t hear anything else. 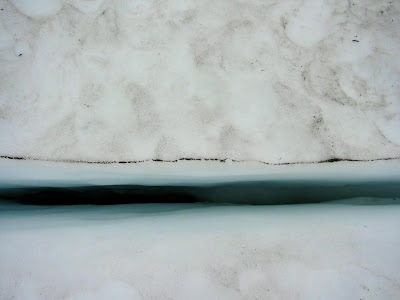 All of that aside it is a very nice hike and the glaciers are very intriguing. While we were at Williwaw, Fred, Jo, Faith and Isabella came to stay for Faith and Isabella’s last day in Alaska. http://www.mytripjournal.com/wanderingwishnies I can’t think of a nicer spot for a last day in Alaska. 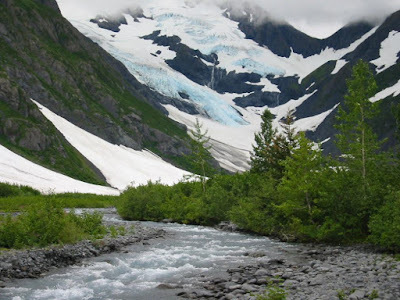 I think what makes the Portage Valley and Williwaw so special is this is the Alaska that most people think about when they hear the word Alaska. It has spectacular tall green mountains with snow fields, waterfalls and glaciers. We returned to Wasilla because some of the parts needed to complete our repairs from July had arrived. Unfortunately one of the parts arrived defective so we still have an outstanding minor issue. However, we are good to go, to start back to the lower 48 states. Wasilla is the last big town we will see until we get to Whitehorse, Yukon in a few weeks. You can tell a town size in Alaska by their grocery stores. The really small towns have no grocery stores. The slightly large towns like Seward and Homer have a Safeway grocery store. The next size up has a Safeway and a Fred Meyer’s store. A big town like Wasilla will have a Safeway, Fred Meyers’s and a Wal-mart Supercenter for groceries. The really big towns like Fairbanks and Anchorage have multiple Safeways, Fred Meyer’s and Wal-marts. Big of course is relative and this entire enormous state has less than half the population of our home town of San Jose, California. So the other reasons we are staying in Wasilla for a week are: to get the truck serviced, stock up on groceries and get Raider’s vaccinations up to date before we start south. Pretty much ever RVer we talk to now is staging to leave Alaska. I think the day after Labor Day someone will fire a starting gun and every RV in the state will head south. Our current plans are to make a few more stops and let the crowd get ahead of us before we leave Alaska. The Headquarters of the Iditarod Dog Sled Race is here in Wasiila. 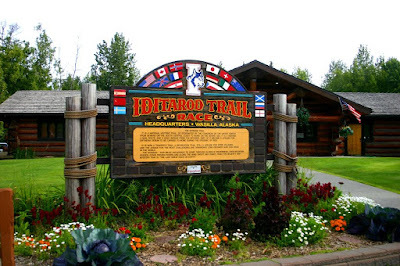 Kathy must be the biggest Iditarod fan in California, so we made a stop at the Iditarod Headquarters and museum. 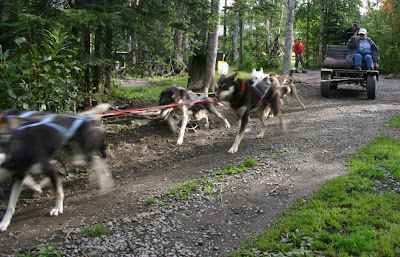 Kathy even got a chance to fill a lifetime wish to be pulled by sled dogs. Since there isn’t any snow in Wasilla just now they use a cart on tires. 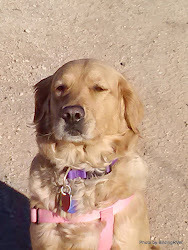 Kathy said it was a great ride and she couldn’t believe how fast the dogs can pull. Her next breath was “Next time I want to be pulled on snow”. Right next to Wasilla is the town of Palmer (only large enough to have a Safeway). It is the home of the Alaska State Fair. The State Fair is a really big thing here in Alaska. People plan for it well in advanced, they take time off work and pull kids out of school to attend. We went on a Tuesday afternoon and it was surprisingly crowded. I can’t imagine how crowded it must be on the weekends! It being the only State Fair we have ever been to we can definitely say that it is the nicest State Fair that we have ever been to. HOLD ON TO YOUR HAT, MOM!